I thought I would share with you all the latest Pinterest recipe I've tried out and liked. I was first attracted to the picture of the pin and then, of course, the name. 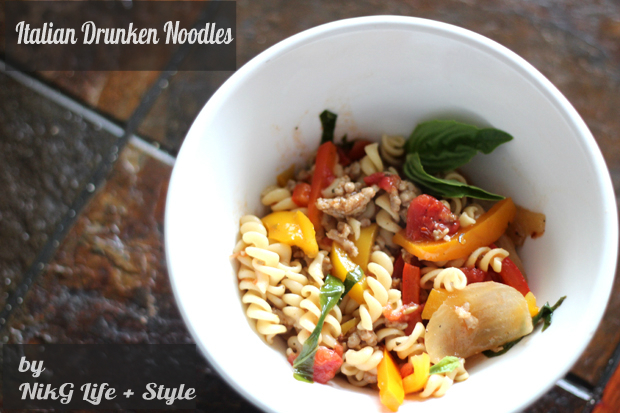 There's just something mouthwatering about the phrase "drunken noodles" for some reason. So I gave it a go, and I have to say it was pretty good. Don't take "pretty good" as a bad thing. For me that just means, that it was tasty--tasty enough keep in rotation because of it's taste, ease, cost, etc. It's like your typical weekly meal, and I will definitely make it again. I did, however make a couple modifications. 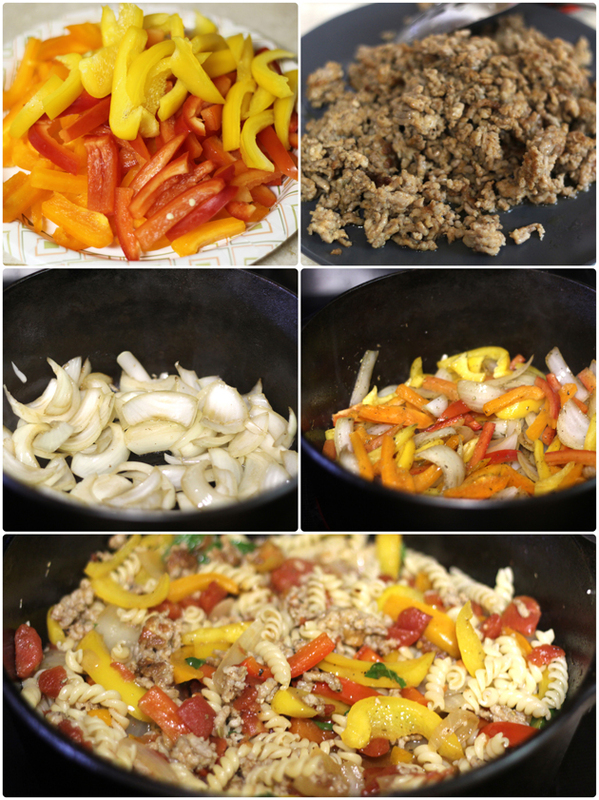 First, as you can see from my photos, I used rotini pasta. I only did this because I already had a box in my cupboard, and I also couldn't find the wide flat noodles that the recipe called for. In the future, I WILL look for those noodles harder as I think it would create a "prettier" dish. The second mod, was that I added a little sugar to the dish (while cooking) to taste. It's a habit of mine to add a bit of sugar to any tomato-based dish. It cuts the tartness a bit and creates a more savory flavor, in my opinion. I also intended to make this dish with turkey Italian sausage. I instead picked up the regular pork variety by mistake. So in the future I will use the turkey. I don't have anything against pork. I do try to eat it at a minimum, which means when I'm eating pork--I make it count (i.e. bacon & BBQ). *smile* Also, this would have been even better topped with a little shaved Parmesan cheese! So if you're on the hunt for a quick and easy week day meal. Give it a try and tell me what you think. The recipe can be found HERE. Looks delicious! Ill give this one a try! yum!! some of my favorite ingredients, so I know I'll love it!